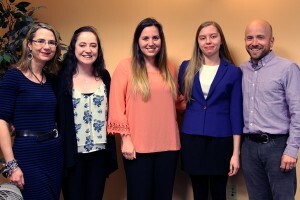 In early May, several University of Southern Maine (USM) students demonstrated just how far their understanding of small business sustainability had come over the course of a semester. 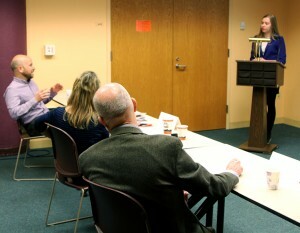 As they explained to a panel of leaders from the small business community how a specific business could benefit from an increased focus on sustainability, and fielded the panelists’ questions, the students demonstrated a comprehension of complex concepts like profitability margins, employee benefits, workforce development, resilient energy portfolios, and more. This illuminating educational exchange occurred at the final Capstone Event for the pilot semester of U360 – Manomet’s newest project that teaches college students about sustainability through engagement with small businesses nationwide. Each student selected one business from their interviews to create a case study and Sustainability Action Plan, which they presented to the panelists, advisors and Manomet staff in a ‘mock pitch’ during the Capstone Event. The profiled businesses included a small logging company in Maine, a quick-service burger restaurant in Colorado, and a community food nonprofit in Minnesota. The recommendations made by the students involved grouping off-site jobs to cut down on vehicle emissions; increasing cross-training of employees; creating written policies for purchasing; and separating accounting and management duties, to name a few. As a result of its promising pilot semester, U360 will continue during the 2016-17 school year. For more information, please contact Lora Winslow at lwinslow@manomet.org.